It’s been a busy week for Golden Horde pitchers Evan Hoagland and Luke Hahn. The two each pitched a complete game and saw action at bat, too, in three games. 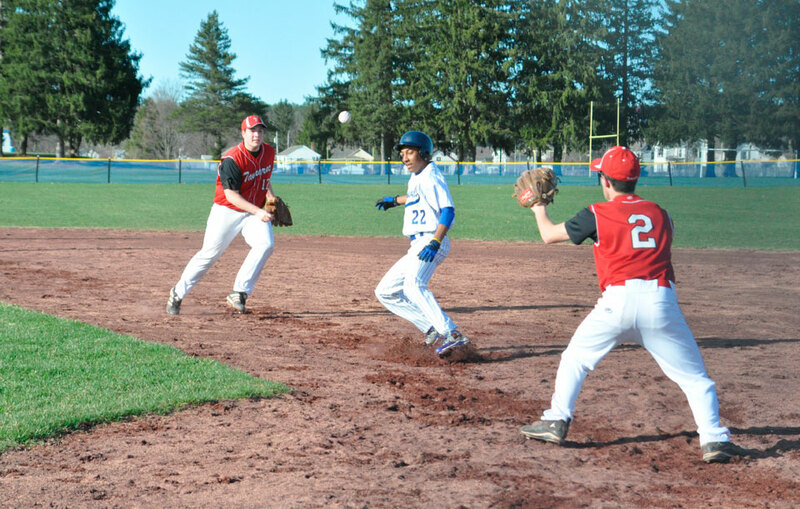 On Thursday, Hoagland gave Tamarac no play with a 9-0 win. Coach Duane Dodge was happy with his team’s performance. “It was a well played game all the way around — it was the best played game so far to date,” he said. Though Hahn stayed off the mound, he went 3 for 4 with a triple. Colton Zavistaski and Jake Young each hit a double and a single for Granville. During the game, Elijah Fournier gave Tamarac players a workout in a rundown between first and second base. For a minute it looked like Fournier would make it to safety. But despite his efforts, it was a brief moment of ‘monkey in the middle’ that eventually ended with his getting tagged and the Bengals out of breath. The next day it was Hahn’s turn to pitch a full game in a 16-10 league win against Schuylerville. Schuylerville caught up a bit in the third, snagging six runs, but Granville was able to hold the line for a win. “We need to not make mental errors. Once they start to realize they can’t give free outs, they do well,” Dodge said. On Monday things took a turn for the worse in a 14-3 non-league defeat to Burr and Burton. Ron Taylor took home the loss on the mound but singled for the Horde. Zavistaski and Hoagland each hit a single as well. Dodge pointed out Burr and Burton was not able to make a run for most of the innings. “It was just those two bad innings when we gave up errors. Other than that we played pretty clean,” he said. Granville is now 3-2 in the league and 3-6 overall. The boys host Cambridge today and Hoosic Valley on Monday.